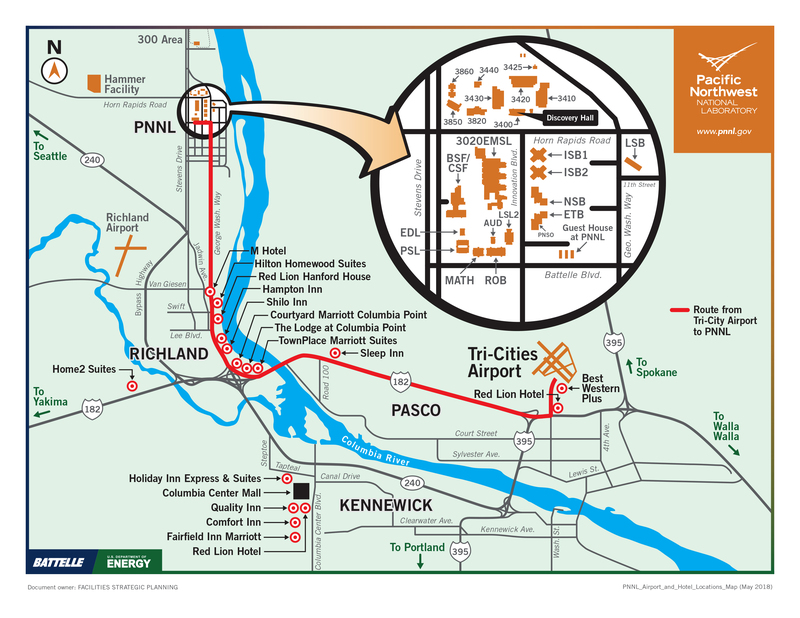 Flights in and out of Richland, Washington can be conducted through the Tri-Cities Airport (PSC). It is also possible to fly into Seattle, Portland, or Spokane airports and drive using a rental car (~3-4 hour drive). Hotels may offer a shuttle service to and from the airport. Please confirm with your hotel if this service is offered. Rental cars are available for rent at the Tri-Cities Airport. Cost for a taxi or rideshare service from downtown Richland to the PNNL Discovery Hall is ~$20. A shuttle service to and from the conference venue ( PNNL Discovery Hall) will not be provided. Conference registrants are responsible for arranging their own transportation. Map of the Richland, Washinton area. Click to expand image.